American manned lunar base. Study 1984. In 1984 a Johnson Space Center team lad by Barney Roberts took NASA's first look at a return to the moon after the shuttle was in service. It anticipated later studies in using NASA's planned infrastructure - the shuttle, a shuttle-derived heavy lift vehicle, space station, and orbital transfer vehicle to build a permanent 18-crew moon base in 2005-2015. Hangars, storage and shops for 4 OTV tugs+3 OTV passenger modules and two Orbital Maneuvering Vehicles. Temporary storage for the lunar lander and payload would also be required. A gantry for preparing up to 40-meter long OTV+OTV+lunar lander stacks, plus various lunar cargo elements. A propellant depot for at least 200t of cryogenic oxygen and hydrogen propellant, plus facilities capable of transferring 5t/hour of propellant to the OTVs and lunar lander. 10KW of continuous additional power for propellant depot refrigeration, 5KW for the extra habitat, and 5KW for the gantry. The unmanned Shuttle-derived vehicle would be launched every three months on average while one Space Shuttle mission every two months would deliver the rest. The average payload mass would thus be about 630t/year. The Space Station would have to support an average of 14 space tug launch, return and refurbishment cycles per year. 25 base elements would have been delivered over ten years for a total of 465t, all by expendable one-way lunar landers. An additional 233t of miscellaneous cargo would be delivered during 86 manned resupply missions in 2005-2015. For manned lunar crew exchange missions, the OTV would carry 5,500kg or 8,000kg cylindrical passenger modules for 4 or 6 astronauts, respectively. The passenger OTV would rendezvous in lunar orbit with a 10,000kg 6-crew lunar lander which would be fueled by 4t of hydrogen brought from Earth and oxygen produced from lunar soil. This would reduce the launch requirement from Earth. The manned missions would also carry an expendable 7,600kg lander plus 3,250kg logistics module for life support of four crew members during lunar launching and landing. 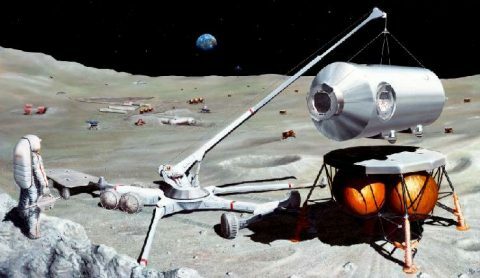 The 1984 NASA/JSC plan called for the development of OTVs and lunar landers in 1995-2003 to permit the creation of small semipermanently manned "camp" on the lunar surface in 2005-2006. The total cost up to the first manned landing in 2003 would have been $20 billion in 1999 dollars, including $4 billion for space transportation. NASA would have launched a lunar orbiting space station in 2008-2009 to support the creation of a permanently manned moonbase by 2009-2010. This operational surface base would have contained an expanded mining facility, lunar materials processing pilot plants and a lunar agriculture research laboratory; pilot oxygen production and experimental mining facilities would have been landed previously. The lunar surface facility would have grown to an 18-crew "advanced base" in 2013-14, consisting of five habitation modules, a geochemical laboratory, chemical/biological lab, geochemical/petrology lab, a particle accelerator, a radio telescope, lunar oxygen, ceramics and metallurgy plants, two shops, three power units (90% lunar-materials derived), one earthmover/crane and three trailers/mobility units... The moonbase would eventually "pay for itself" by exporting lunar oxygen ("LunOX") to space industries in Earth orbit produced by lunar mining and oxygen production/manufacturing facilities like the one shown here. The ultimate goal would be a self-sustaining moonbase by 2017-18. This facility would support full scale export of lunar oxygen to Earth orbit and the need for Earth imports would be reduced thanks to "closed" ecological life support systems, lunar power stations entirely derived from lunar materials as well as volatile production for agriculture and local transportation needs. Tools, containment systems, fabricated assemblies etc. would also be produced by the lunar factory. By this time, the number of manned expeditions from Earth would be six per year. The first manned landing would take place in 2003, followed by one mission in 2004, two in 2005, three in 2006, four flights per year in 2007-2009 and six missions/year in 2010-. The total cost (1999 $'s) of the undertaking was shown below. This "Lunar Self-Sufficiency Research Colony" scenario described was the most expensive of three options studied by NASA. It would have cost $90 billion at 1984 economic conditions or close to $150 billion in 1999. The least expensive option (lunar resource utilization/production base) would have cost $79 billion (1984 $) while a science base would have been slightly more expensive. Family: Lunar Bases. Country: USA. Agency: NASA Houston.